Professional Bike Fitting to Improve Cycling Performance and Prevent Injury. Bike Sizing Guide - Road Bikes. Choosing the correct bike should be similar to buying a new pair of shoes. The choice may be for general use, or a specific function. Style, brand, colour, price, availability and durability are all key considerations, but no one would buy a pair of shoes if they did not fit. The same should be said of bicycles, but far too frequently cyclists buy bikes that are the wrong size for them. Fortunately, the inherent adjustability of bikes means that you may be able to get away with a bike one size away from the ideal, but any more than that and it is unlikely you would ever be comfortable. So how do you make sure a bike is the right size for you? By far the most important consideration is the frame size. Although there are many dimensions used to define a frame, ultimately there are only three that are important, the seat tube angle and the horizontal and vertical distances between the crank centre line and the top of the head tube. The traditional way to define the top of the head tube was to measure along the seat tube from the centre of the bottom bracket, then horizontally forwards along the top tube. This worked very well when frames had horizontal top tubes but can get confusing with compact frames with sloping top tubes. Conventional road bikes have seat tube angles within a relatively small range (72.5°-74°), so if only considering this type of bike, you could argue that there only two key dimensions, hence some manufacturers have started to use Stack and Reach to define the relative position of crank and top of head tube. This ignores the seat tube angle altogether and although people would like to suggest it is better geometry, it tends to be similar, just measured differently. So, just as we have started to ignore seat-tube angle, it is worth considering why everybody has used essentially the same angles here for so many years. In simple terms, we lean forwards on our bikes to maximise our aerodynamic and biomechanical efficiency and the approx. 73° seat tube angle gives the best compromise of these factors along with balance and weight on our hands and arms. Fit Guidelines shows how to achieve the correct saddle height, fore-aft location and suitable upper body positions. The frame size should be chosen to allow the hands to fall naturally to the handlebars whilst adopting these postures. This may need some adjustment of the stem length and height, but this is a relatively cheap component and easily worth changing to ensure comfort. 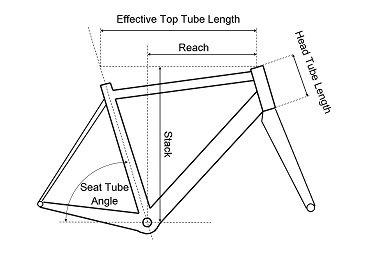 To conclude, frames come in a variety of sizes with the top of the head tube moving up and away from the crank centre as the size of the rider increases, so theoretically, one could use the manufacturer's guidelines for a suitable size based on your height and then fine tune the position using the adjustability of seatposts, stems etc. This approach works for many people, mainly because they are of average height, flexibility and of normal proportions. Other variables such as crank length and handlebar width also need to suit the rider and manufacturers will tend to specify these proportionately i.e. wider bars and longer cranks on bigger bikes. Other factors possibly should have more variability but traditionally don't. For instance every size of bike in a manufacturer's range will have the same saddle and lateral pedal spacing. Very few of us are normal so we may need to modify our choice of frame size, or the components fitted to the bike to ensure a suitable fit. The main reasons an 'off the peg' bike might not be an ideal fit usually fall into one of three categories. 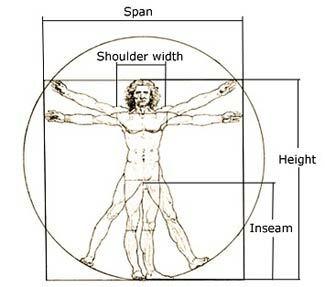 With help from Leonard De Vinci's Vitruvian man we can begin to understand why body proportions can be so important. As a rule, our span is as wide as we are tall, so comparing both measurements will imply if you tend to have long or short arms for your height. The ratio of inseam to height is the most critical metric though. Men will typically have an inseam 46.5-47.5% of their height and although it may not sound like a big difference, less than 45% or more than 48% is noticeable short or long legged respectively. Contrary to some popular opinion, women do have longer legs, with 47.5% to 49.0% the usual range. So knowing this simple information, how might it affect our choice of bike. Short legs will also mean a long torso, so there is danger of the rider being too hunched up on a height suitable bike. The short legs will also mean a lower saddle height, so the distance between saddle and bars is reduced anyway. With a bit of luck, the short legs may also mean short arms which would balance out the long torso! The biggest danger here is selecting a bike based on top tube length i.e. larger than normal for overall height, but then suffering from cranks that are too long. A better compromise may be the use of a longer stem. Sorry for all these long legged people, but this is the worst case for achieving an optimum bike fit. The long legs will mean a high saddle, so the bars become relatively far away. Long legs imply a short torso, so the reach to the bars becomes excessive. One could consider a shorter top tube, but this would also tend to come with a shorter head tube which is counter-productive. What tends to happen with very long legged people is that stems have to be short and as high as possible, often achieved by flipping them over as well as using all the available spacers. In many cases this is still not enough and the saddle also has to move further forwards than is ideal. Many people do not like the aesthetics of this stem configuration, in which case the best option is to select a bike with Sportive or Touring geometry, i.e. one with relatively long head tube or Stack for its size. Handlebar width would normally be bike size specific i.e. the bigger the bike the wider the bars. Ideally the bar width will match the shoulder width, but not all tall people have broad shoulders or short people narrow. As mentioned previously, the spacing across the bike between the pedals is nearly always the same throughout a manufacturers range for double chainsets, then wider for triples. This just leaves the relatively small amount of lateral adjustment in the cleats to accommodate the differences between very broad or narrow hipped people. Some pedals have enough thread length to be able to space them out with washers, whereas Speedplay pedals offer longer spindle lengths. 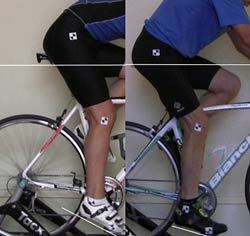 Loose hamstrings are very useful for cyclists, permitting more knee extension and more aggressive torso angles. This only becomes an issue from a sizing perspective if combined with relatively long legs and as we often see with women, a plantar-flexed (toe down) ankle posture. These all combine to move the saddle up and away from the handlebars giving the 'Long Legs' scenario above. Short hamstrings / poor lower back flexibility. Tight hamstrings and lower back will inhibit knee extension and the ability to lean forwards. This will give a upright torso, compromising the reach to the handlebars. The cyclist shown here on the left has normal female proportions, loose hamstrings and a toe down pedalling style. The gentleman on the right also has normal proportions, but tighter hamstrings and a lower heel. They are both of a similar height, but their preferred saddle heights are very different. Small bike wheel / foot overlap. You may notice that smaller bikes tend to have more upright seat tubes. This is driven by our desire to commonise wheel diameters to 700c. The more upright seat-tube prevents any clash between the front wheel and the feet when turning sharply. This forwards saddle position can lead to excessive weight on the hands so seat-posts with more set-back and shorter stems may be required. There seems to be an increasing trend for some manufacturers to regard 172.5mm cranks as the new Standard, fitting them to the majority of the bikes in the their ranges, including the relatively small or medium 52cm, 53cm and 54cm sizes. One might imagine that there may also be a financial incentive to do so as manufacturing cost and complexity is reduced. Cranks that are too long will inhibit the riders ability to 'spin' and can often lead to knee and lower back troubles. We can take considerable care and attention to select a suitable frame size, but handlebar choice could make as much difference as one frame size up or down. 'Compact' bars have become very fashionable as they offer a shorter height difference between being on the hoods and drops. This can be very useful in making the drops more accessible for people who may have found them too uncomfortable otherwise. When on the drops, to avoid fouling your wrists against the bar bends, the bars tend to flare out and have a shorter reach of 80mm compared to the more usual 90-100mm. This table is a summary of the geometry of a large selection of roadbikes on sale in the UK today. It is by no means exhaustive, but does cover bikes marketed as both Race and Sportive oriented. One can see that there is considerable overlap between sizes and variety within one size category. *Unlike all the other dimensions, the crank length is the generally acknowledged recommendation based on the inseam measurement, not the items typically supplied by the manufacturers. It is not intended that this table is used to define your correct size, but to be able to compare the geometries of any bike you may be interested in purchasing against the 'norms' within that size range. By coupling this with knowledge of your body proportions, flexibility and intended riding style, a better judgement may be made. If still bewildered by the choice of bike size, the best approach would be to visit as many bike shops as possible , compare their advice and sit on a few bicycles. Preferably you will be able to pedal the bike on a stationary trainer and the saddle should be adjusted to somewhere close to what you need. Alternatively, see Bike Sizing Options for the telephone consultation or sizing jig options available from BikeDynamics Ltd.